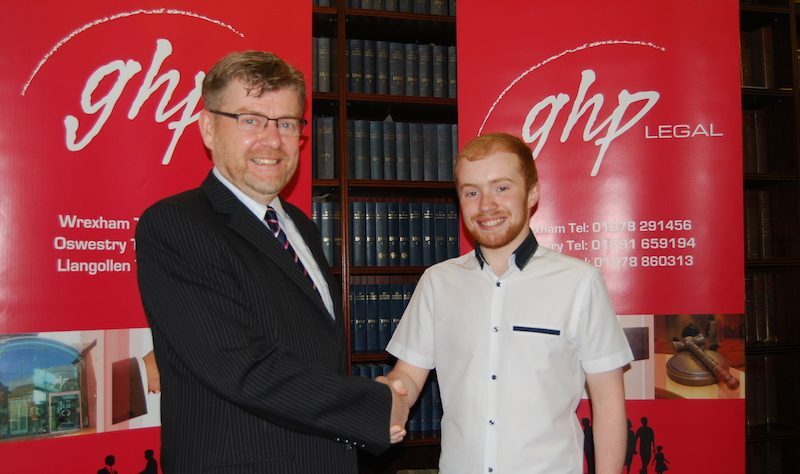 The first winner of the GHP Legal Essay Competition for Yale Sixth Form, Coleg Cambria students was recently announced. Jacob Keene, 18 from Buckley has secured a week’s work experience with the leading law firm after impressing them with his legal research and practical approach to problem solving. The placement will include a full week shadowing legal professionals in the criminal and civil litigation departments. Claire Parfitt, a Solicitor with GHP Legal, and herself a former student at Yale Sixth Form, Coleg Cambria, has created the competition with a view to fostering and encouraging young talent in the local area. Lucy Brown and Neil Roberts from Yale Sixth Form thanked Claire and Robert Williams, Managing Partner of GHP Legal and Head of Civil Litigation, Personal Injury and Dispute Resolution, for the excellent opportunity afforded to Yale Sixth Form Law students. Lucy Brown, Jacob’s tutor, said: “This excellent competition has allowed Jacob to showcase his skills, and over the summer Jacob will gain an insight into the practical operation of the law with a prestigious law firm.